The AC 428 Frua sports car, also known as the AC Frua, was introduced in 1965, and was based on the chassis from the AC Cobra 427 Mark 3 that had been increased by six inches. 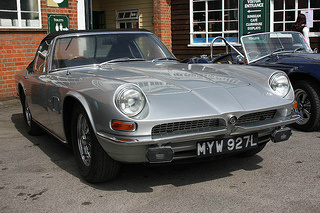 It was available as both a fixed head coupe and a convertible. The body consisted of steel panels, and was attached to a chassis which incorporated four inch tubing, and four wheel independent coil spring suspension. However, since the chassis's design was quite intricate, it had a tendency to rust. Interestingly, both the bonnet and boot lid were constructed from aluminium. A problem in the construction of the Frua was that the rolling chassis was built in the UK by AC, and then shipped to a workshop in Italy where the body was added. At this point, the partially assembled car was shipped back to AC who then completed the assembly work by fitting the engine, gearbox, and trim. This long-winded process was very costly, which led to the fact that pricing tended to be uncompetitive. Owing to the lack of financial resources, AC was unable to fully develop the Frua, which suffered from a number of problems. The most acute was that heat from the V8 engine tended to cause a great deal of overheating in the cabin, a problem not uncommon in previous AC models. 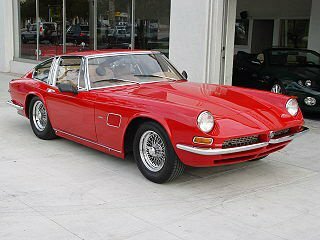 The 428 Frua sports car was designed by Pietro Frua of Turin, from which it derived its name, and it displayed a striking similarity to the Maserati Mistral, styled by the same designer. 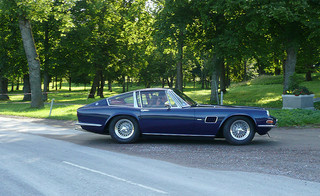 The Frua was a serious competitor to the Jensen Interceptor and Aston Martin, and it could more than hold its own with many exotic European cars, such as Ferrari, Lamborghini, and Maserati, and with a more modest price tag. The AC 428 Frua sports car was powered by a 428 ci (7 litre) big block, Ford FE V8 engine, fitted to an Autolite or Holley 4-barrel carburettor, and using an iron cylinder block. An alternative engine was also used on some units, and consisted of the classic 427 ci Ford Windsor V8, as used in the Cobra. The 428 unit developed 345 bhp at 4600 rpm, and 474 ft/lbs of torque at 2800 rpm, with a top speed of 141 mph, and a 0-60 mph time of 6.2 secs. Although the 428 coupe had fairly impressive performance figures, it was let down by the price of £5,573, more than twice that of one of its competitors, the E-Type at £2,225. A more aerodynamic version of the convertible, which even sported electrically operated headlights that popped up, reminiscent of the Lotus. However, neither reached production owing to the parlous state of company finances at that time. Production ended in 1973 when a total of 81 units were built, made up of 49 fixed head coupes, 29 convertibles, and 3 units fitted with a special body. Production of the AC Frua sports car was limited by the throughput of the Italian coachbuilder, and the availability of Ford engines. In the end, it was the energy crisis of 1973 that finally heralded its demise.